Welcome - Willkommen - Bienvenue! 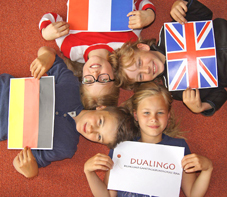 Welcome to the website of DUALINGO – the bilingual all-day primary school. Our school was founded in 2007 and is located, along with the integrated DUALINGO German Red Cross day nursery, in a state of the art, low-energy building on the Saaleufer in Jena Ost. The school is recognised nationally and is one of the only schools in Thuringia to offer in-depth language learning from the first class. The school’s basic principles for teaching stem from the Thuringian Education Act, the curriculum, the syllabus and above all, our school concept.